A man in his thirties who was know with an auto-immune disease (exact diagnosis is still unknown) which was associated in his case with asthmatic disease. At the outpatient clinic of the pulmonary diseases, a routine ECG was performed which showed signs of LVH with deep negative T-waves in V3-V6 and terminal negative T-waves in the inferior leads. He was free of cardiac complaints (no palpitations, no syncope, etc). His family history was unknown. He was consequently send to our outpatient clinic for further evaluation. On the conventional ultrasound there were signs of LV hypertrophy. 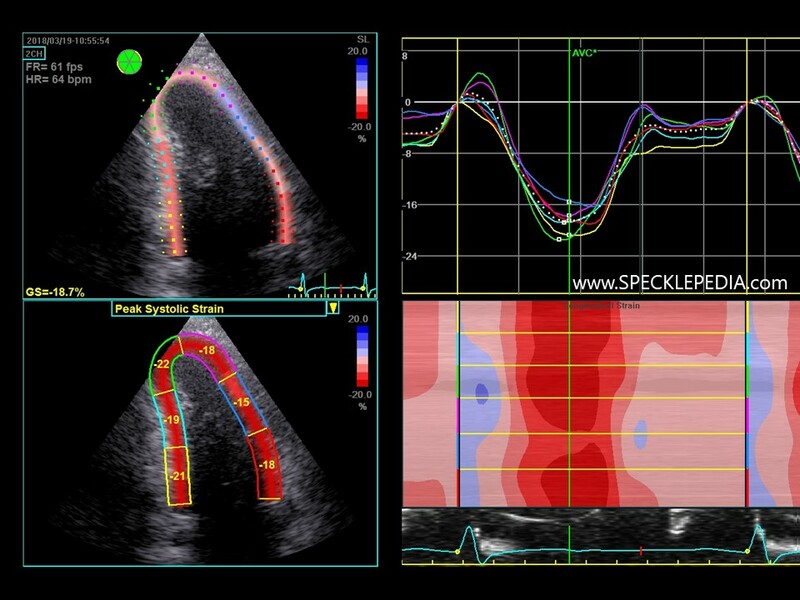 The septal was measured 14mm, the posterior wall 13mm. The apex also appeared hypertrophied in the apical views. 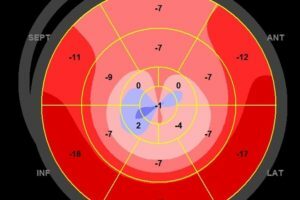 The Diastolic function is most likely abnormal with a long E deceleration time and a dilated LA (LAVI 45ml/m2). There were no signs of LV outflow tract obstruction (see LVOT gradient below), nor did we observe SAM. The following findings by deformation imaging analysis were not typical for HCM. 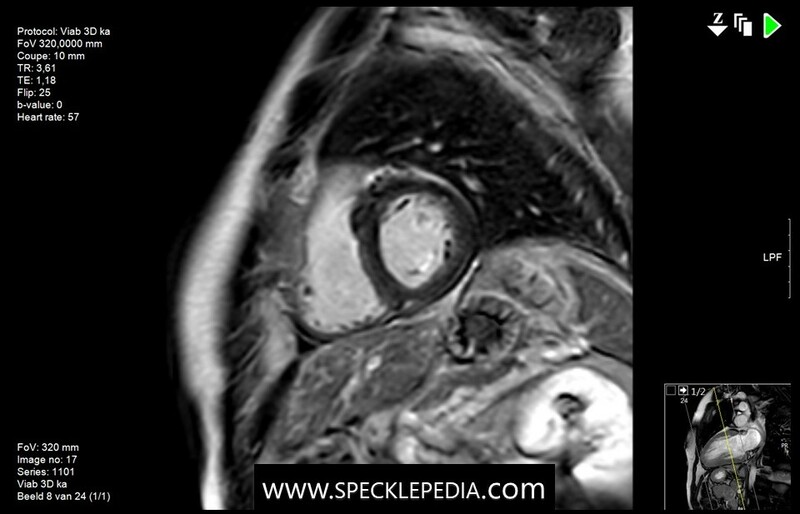 Nevertheless, there were some abnormalities seen which raise the suspicion of an underlying cardiomyopathy. 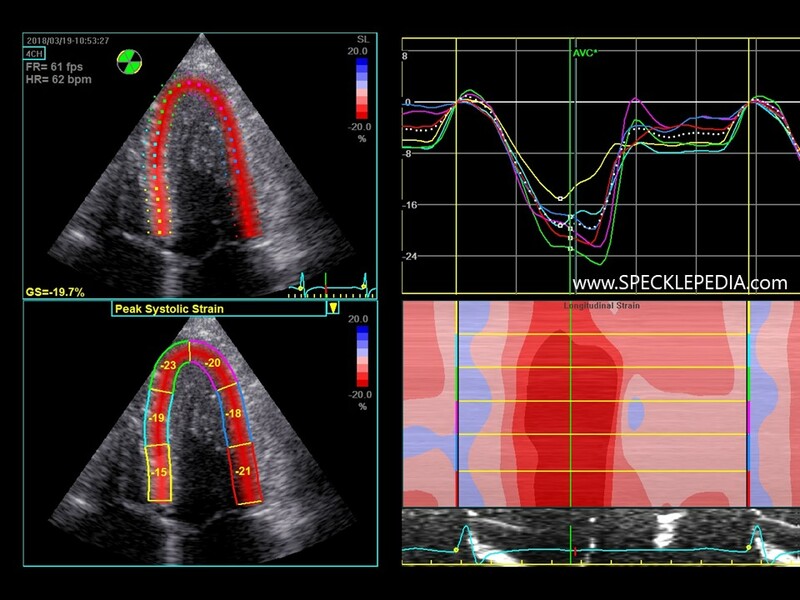 In the basal septal wall, the longitudinal peak systolic strain is reduced compared to the other segments. The cut-off value for HCM is not met, nor is there any post systolic shortening. 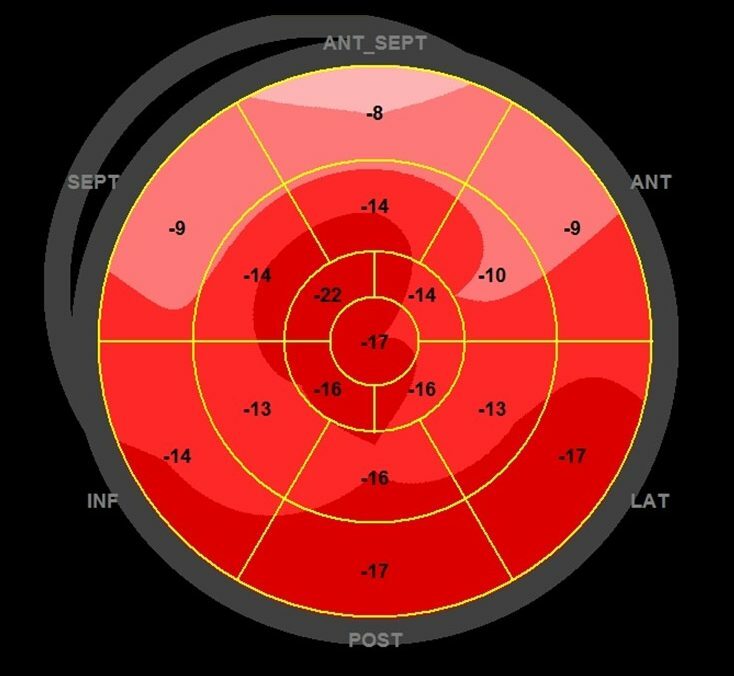 Interestingly, in the posterior and lateral wall, at the midventricular segments, the peak systolic strain value is also moderately reduced to values between the -15% and the -18%. 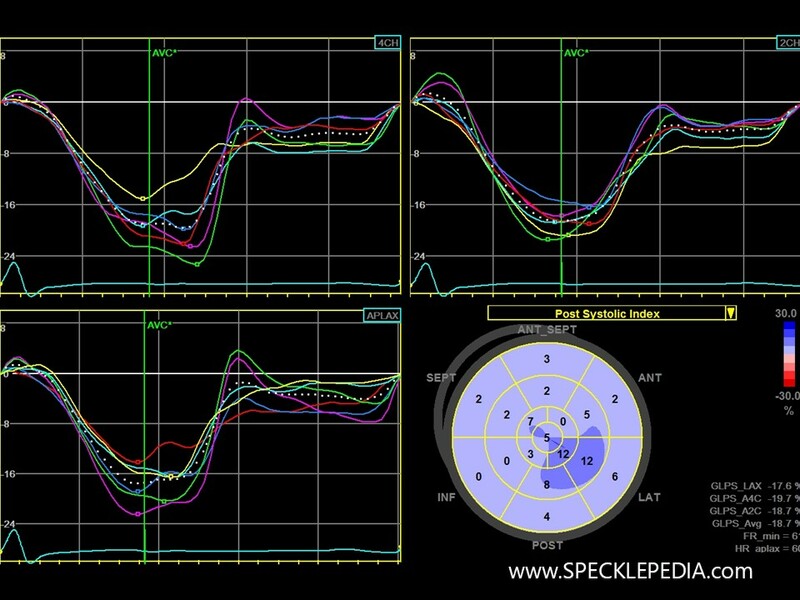 Secondly, there is also post systolic shortening in this region. These two findings combined with the increased wall thickness at that site (and the repolarization abnormalities at the lateral leads) are all very suggestive of a hypertrophic cardiomyopathy. 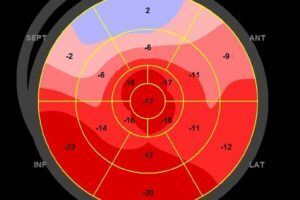 Additional CMR recordings confirmed the hypertrophy (septal thickness of 13 and apical segments up to 16mm). The LV systolic function was good. There were no regions with gadolinium enhancement. 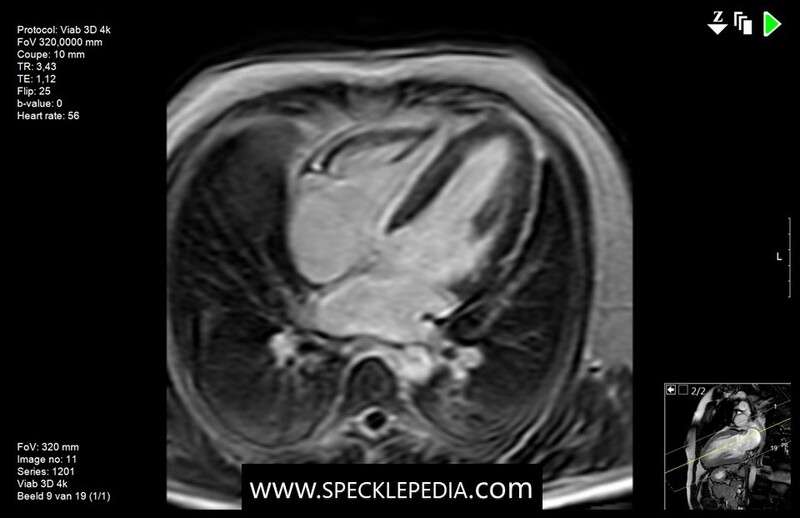 There were no signs of amyloidosis, Fabry, or hemochromatosis.